Tyburn, near Marble Arch, was the site of ' The King's Gallows' from 1196 to 1783. It was thus the one-way destination for six centuries for every kind of criminal. In the reign of Queen Elizabeth I, the famous Triple Gallows was set up. Tyburn Gallows has many names during its history: The Elms, the Elms near Tyburne, Tyburn Tree, the Deadly Never Green Tyburn Tree, the Triple Tree. The meaning of Tyburn Tree under went a religious transformation once so many Catholic Martyrs died there during the reformation. The Martyrs changed Tyburn’s Deadly Tree into Tyburns Tree of Life. Tyburn's first recorded execution took place in 1196, when William FitzOsbert, or William with the Beard, was hanged for sedition. Ralph of Diceto tells us that William "his hands tied behind him, his feet tied with long cords, was drawn by means of a horse through the midst of the city to the gallows near the Tyburn. He was hanged." The Elms near Tybourne were called "the King's Gallows". Thus Tyburn from the beginning was clearly the King's gallows for London and Middlesex criminals. That it was placed outside the boundary of the city indicates the administration of the criminal law by the King's courts instead of by the local or manorial courts. The manner of execution at Tyburn seen in William FitzOsbert's execution was to become the norm later. 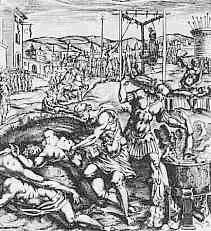 That is, the condemned criminal, after being drawn to Tyburn on a hurdle or rough sledge by a horse, at Tyburn was first hanged on the gallows, then drawn or disemboweled, and finally quartered, his quarters being placed high in public places as a warning to others. Thus, because Tyburn was the King's Gallows, those who were guilty of Treason were Hanged, Drawn and Quartered on this spot. Some say that over fifty thousand persons met their death at Tyburn during the six centuries it was a place of execution. To this list we must add in 1661 the lifeless bodies of Cromwell, Ireton and Bradshaw were exposed at Tyburn and beheaded. The 105 Roman Catholic Reformation Martyrs are not given here. The executions at Tyburn provided London's most popular and frightful sideshow. The ritual cruelties and indecencies practised here thrilled and corrupted every class of society. Along with criminals, saints and martyrs were butchered on Tyburn Tree.